Mariéme Jamme is a Senegalese born British Technology businesswoman. Her company Spotone Global Solutions helps technology companies to set a foothold in Africa, Europe, the Middle East and Asia. She has supported many organisations such as Google, Ernest and Young, HSBC Private Banking, The Office of Gordon and Sarah Brown, The Africa Progress Panel chaired by Kofi Annan, The Obama Administration and multiple African governments through their STEM policies. Mariéme was named one of the 100 most influential Africans by the African Business Magazine and 20 youngest powerful women in Africa by Forbes. 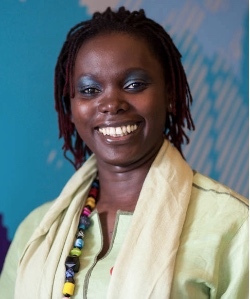 Marieme newly became Advisory Board Member of Data Pop Alliance, a global coalition promoting a people-centered Big Data revolution and a judge and Academy member of the Prestigious Global Teachers Prize Academy. Marieme was honoured as a Young Global Leader by the World Economic Forum for her activism work in empowering and investing in young women and girls through Creatives learning, Entrepreneurship, Science, Technology, Engineering, Art, Design and Mathematics. Co-Founder of Africa Gathering, one the leading platform in Europe that enable businesses, governments and entrepreneurs to share ideas about Africa for positive change, She also recently joined forces with a group of African leaders to create Accur8Africa, a new platform aiming at enabling governments, businesses, entrepreneurs and the civil society in Africa at measuring the success of the Sustainable Development Goals by 2030 with Accurate Data.